A few years ago I was looking for some spoken word poetry performances on YouTube in the hopes of motivating my students to put passion and expression in their own poetry performances. Every April I had my 6th graders memorize and recite a poem of their choosing. 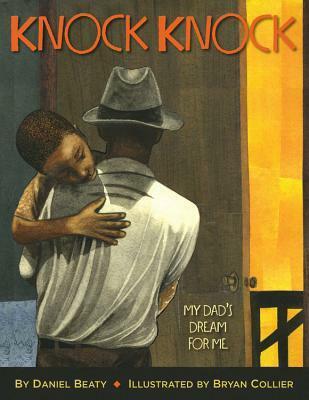 It was then that I came across the young Daniel Beaty's Def Poetry performance of "Knock Knock"
I was so moved by this performance that I just knew I had to show it to my students. I imagine if Langston Hughes lived in the 21st century, he'd sound a lot like Daniel Beaty. Out of all the spoken word poems I have shown my students, this one garners the most discussion and curiosity. Some students ask, "Wait, so what happened to his dad?" Others confidently respond, "He went to prison." I push their thinking further by asking, "What does Beaty say in the poem to leads you to believe his dad is in prison?" And soon students are asking me to show the performance again so they can pick up on the details they missed the first time. Last year my students were so moved by this performance that many of them felt genuine compassion for Beaty and wanted to know more of his story. So when I discovered that Beaty had turned his spoken word poem into a picture book I was elated. And knowing the story of the poem, I was already deeply affected by the book just by the cover alone. Bryan Collier's illustrations add an extra layer of emotion to Beaty's words. I will say that as much as I loved this picture book rendering, Beaty's spoken word performance is still more powerful in my mind. Because of his need to tweak some of the point of view to make it more appropriate for a picture book telling, some of the impact of his original message is diminished. But for younger kids, it is still a powerful story. I will be absolutely shocked if this book doesn't receive a Coretta Scott King nod in January. The only reason it might not is because it will be published so late in the year (December 17th). But even still, you can't deny what a worthy award-winner it would (and should) make. Wow. That is powerful. I'm so glad you share it with your students and that you shared the book with us so I can check it out!